Medications containing ibuprofen already have the risk of producing some serious side-effects, therefore it is a very good possibility that drinking alcohol while taking ibuprofen could intensify those effects. Ibuprofen is in a class of medications known as nonsteroidal anti-inflammatory drug (NSAIDs) which are used mainly to relieve pain. It is an over-the-counter medication but also is sometimes combined with other drugs in prescription medications. It is also used to reduce fever and to relieve minor aches and pain from headaches, muscle aches, arthritis, menstrual periods, the common cold, toothaches, and backaches. Can You Drink While Taking Ibuprofen? The answer to whether or not you can consume alcohol while taking ibuprofen is, "it depends." If you are already experiencing some of the side-effects of ibuprofen listed below, you may not want to drink any amount of alcohol because you run the risk of increasing the severity of those effects. If you are not having any side-effects from using ibuprofen, you may be able to drink a moderate amount of alcohol and not experience any negative reaction. But, the key word is "moderate," and that means less than 14 drinks a week for men and less than 7 drinks a week for women. If you are a heavy drinker or a binge drinker or sometimes drink three or more drinks per day, you can significantly increase the risk of developing some of the side-effects listed below. Ibuprofen and other NSAIDs have been found to cause ulcers which in some cases can lead to gastrointestinal bleeding or perforation (holes in the stomach or intestine). These gastrointestinal problems have been found to develop at any time you are taking ibuprofen and can happen without any warning symptoms. Any of them obviously could result in death if not caught or treated early enough. One of the health risks of alcohol use listed in the U.S. National Library of Medicine's Medical Encyclopedia is bleeding from the stomach or esophagus. It stands to reason that if you are taking ibuprofen drinking alcohol can compound the risk of gastrointestinal bleeding. Research has shown that long-term use of ibuprofen can damage the kidneys. Because heavy alcohol consumption can also cause kidney damage, it makes sense that using the two together can greatly increase the risk of developing kidney problems. Studies have found that people who take NSAIDs, other than aspirin, have a higher risk of having a heart attack or stroke, compared with people who do not take NSAIDs. The risk is much greater for those who have taken NSAIDS such as ibuprofen for an extended period of time. Heart attack and stroke as a result of taking ibuprofen can happen without warning and can be fatal. 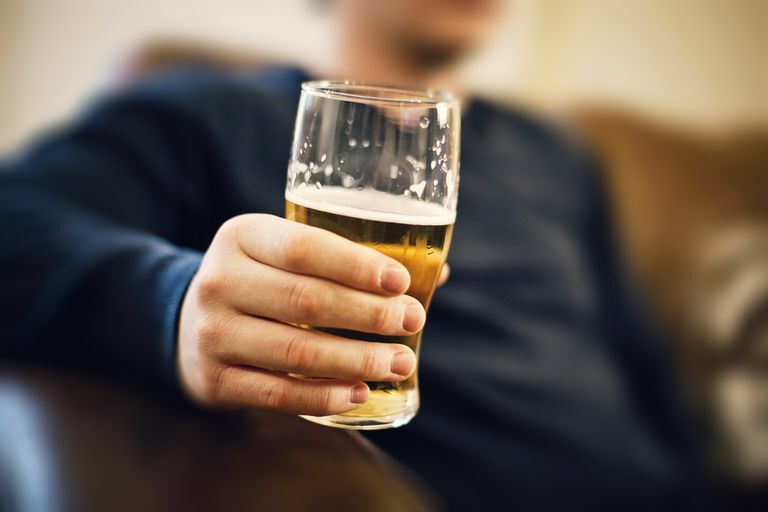 Drinking alcohol can also cause heart problems in some people and make it more difficult to control high blood pressure for those who already have high blood pressure. Therefore, combining ibuprofen and alcohol could increase the risk of heart and blood pressure-related problems for some people. Drinking and driving alone is dangerous, but driving while drinking and taking ibuprofen is certainly not recommended. Because women tend to metabolize alcohol more slowly than men, alcohol remains in a woman's system for a longer period of time and, therefore, increases the likelihood that it will interact with ibuprofen even when drinking less alcohol. Consequently, women who drink and take ibuprofen are at greater risk to develop damage to their kidneys and other organs. This is especially true for older women, according to the American Society of Health-System Pharmacists. If you take ibuprofen occasionally to relieve a headache, pain, or fever, you are probably completely safe in drinking a moderate amount of alcohol. However, if you take ibuprofen daily for osteoarthritis, rheumatoid arthritis, or other chronic pain, you may want to think twice about combining it with alcohol. Also, if you have been taking ibuprofen over an extended period of time, drinking alcohol in any amount may not be a good idea. If you are experiencing any of the side-effects listed above, you may also want to avoid consuming alcohol or consult a medical professional before doing so. Is Ibuprofen Safe for Chronic Pain? How Do You Choose the Right OTC Pain Medication?